There are plenty of lower-budget independent films that have gone on to be more critically acclaimed and more financially profitable than big-budget Hollywood pictures. What is rare, however, is an indie film that masquerades as one of these pictures. A self-labelled “all-star indie action blockbuster” and “inspired by history”, 'Ironclad' is such a film, trying to redefine the boundaries of British cinema. Whether by intention or by coincidence, 'Ironclad' picks up a few years after the end of Ridley Scott's 'Robin Hood'. It is England, 1215. King John (Paul Giamatti) has been forced to sign the Magna Carta, which limits his power and ensures the freedom of men. With the help of a Danish army, the King rampages across the country to regain absolute power. Baron Albany (Brian Cox) and a band of rebels take Rochester Castle in an attempt to stop the tyrant king. A siege takes place, and the rebels must hold the castle until reinforcements arrive. The film certainly ticks many of the boxes of an action blockbuster. There's a clear “big bad guy vs. underdog good guy” vibe, plenty of action, and some veterans among the B-list cast. The $25 million budget, although pocket change in Hollywood, shows how badly this indie film wants to be big. A big film, however, is not necessarily a good film. 'Ironclad' is at its strongest when it comes to the physical side of things. It does not shy away from gory violence. Heads, hands and feet go flying, blood splatters all over the the camera's lens, and there's a particularly nasty bit involving a man and a catapult. The weapons feel like instruments of destruction rather than Medieval-chic accessories, and often succeed in making viewers wince. The fight choreography is particularly impressive - characters look like soldiers trying to tear each others' hearts out, as opposed to actors trying to high-five each other's swords. The action sacrifices style and appearance for physicality and brutality, which results in a refreshing level of authenticity. The 13th century England recreated looks good enough to fool anyone but a history buff. Giamatti and Cox play their roles with conviction and succeed in getting the story moving. Giamatti is particularly watchable, playing King John as an unhinged sadist. The narrative is where 'Ironclad' falters. Fully aware that the film is essentially about a group of soldiers in a building, the writers have tried to spice things up. One of the rebels (James Purefoy) happens to be a Templar Knight. He regrets killing people for God, so he goes on a diet of silence and chastity, the latter of which is tested (of course) by the lady of the castle (Kate Mara). These are ill-advised attempts at emotional content and only serve to distract from what should have been a simpler, more polished affair. Regrettably, the filmmakers decided to emulate that most repulsive staple of modern action blockbusters - the shaky-cam. Specifically namechecking 'Transformers 2' and the 'Bourne' sequels as influences (not a good sign), they decided to shake the picture to create “a very real sense of action”. What is achieved instead is a very real sense of frustration every time the action is made unnecessarily incoherent. Once again, the “Michael Bay Effect” has ruined a film that would have otherwise looked excellent, and wasted the work of an obviously talented action choreographer. Despite its flaws, fans of mud'n'blood, hack'n'slash mini-epics will find plenty to like in 'Ironclad'. It is comparable to 'Robin Hood' despite costing $130 million less to make. Director Jonathan English wanted to create an action blockbuster. In terms of scale and ambition, he has succeeded. But blockbusters aren't perfect, and neither is this. 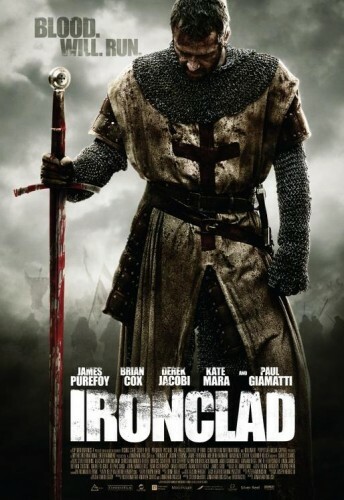 'Ironclad' is showing throughout UK cinemas beginning today.